Here's how to use RiteBoost to instantly improve every post you share to social. Get your posts see through auto-generated images or images extracted from URL and get them found through social search with automated hashtagging. Get targetted visits to the site or landing page you want your audience to click through to. Be sure to watch the video in the main RiteBoost help page. The RiteBoost browser extension lets you do any/all of these things by right-clicking in a post and selecting one of your Enhance presets. Get the RiteBoost extension for Chrome, Firefox or Safari by visiting RiteBoost on the browser you want the extension for. Write/paste your post/Tweet, preferably with a page URL to be shared. Right-click for your Enhance option(s). 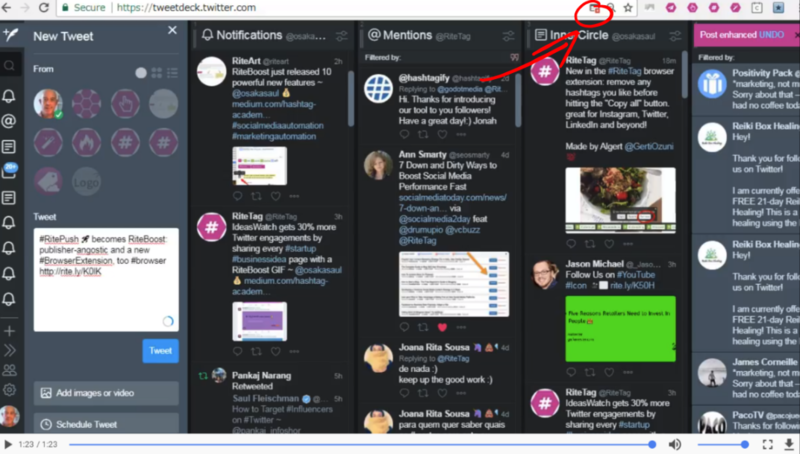 Note that if you use Extract images from links or Create image/GIF from template in your Enhance presets, as per the latest Tweetdeck update, you may find that you need to allow pop-ups. You can modify and create in the RiteKit Image/GIF Templates tab (you will want to replace our logo with your own logos, which can be different per template) and then, in your master Enhance settings you'll want to select and save either Extract images from links or Create image/GIF from template (and select your default style). Note that if you're using the extract image option in your default Enhance, if you highlight text and hit the RiteForge browser button, you'll get both the image/GIF quote and the featured image from the URL (when possible), since your default is to extract, but you highlighted text. Just click the X on the image to remove the one you don't want.